Recently, Adjust released a report detailing differences of user behavior between retargeted users, and those newly acquired. With Aarki, we’re below publishing an excerpt of the article. If you’d like to read more, you can find the whole article here. Retargeting works, at least that’s what we set out to prove when we started with this study. Our hypothesis was simple: that retargeted users outperform new users when it comes to retention, events and (most importantly) revenue events. Below you’ll find a breakdown of those three key areas. But first, if you want the quick takeaways, read the summary first. Retargeted users have a 152% higher engagement rate (number of events per user) than new user acquisition campaigns over 30 days. On day 1 of install, it’s nearly 200%, before dropping off by week 4. 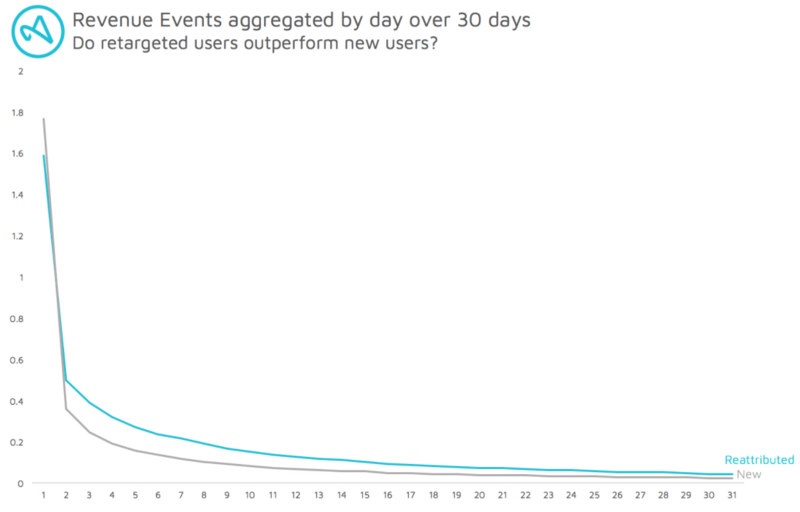 Retargeted users make 37% more revenue events in the first 30 days versus new user acquisition campaigns. On the first day of a campaign, retargeted users retain by 5% more than new users, and typically remains at a 5% difference by day 7. Events, are actions performed in-app by any user - this could mean anything, such as buying a dress, or clicking a link. We aggregated the data sample over a period of 12 weeks, and found a few interesting things - namely, that reattributed users interact with apps more than their newly acquired counterparts, and do so over the entire lifecycle. On day of install, old users reach near-double performance than that of new, with 86 aggregated events per user in a single week vs. 44 for new ones. 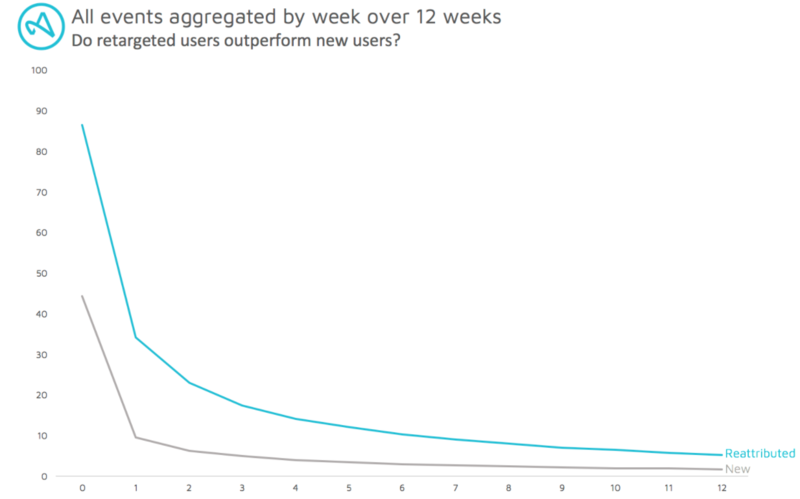 By week 4, there’s a significant drop-off for both groups, though retargeted users still complete 10 more events in a single week than new users do. Spoilers here: retargeted users make more revenue events in the first 30 days of install, up until about week eight. After this, both sets of users behave relatively the same. Here we see a nine percent difference on day one of install. By day seven, it’s a 49 percent difference in the likelihood that retargeted users are still likely to trigger a revenue event. That’s a wide margin, and one to consider when thinking about LTV. That said, remember that for users to become retargeted, they must start out as new users. What this means is both audiences are important, and it’s vital that you don’t neglect new users who’ve since abandoned your experience - as they present great targets to produce more revenue, and more engagement. In general, retargeted users have a slightly higher level of retention than new users. 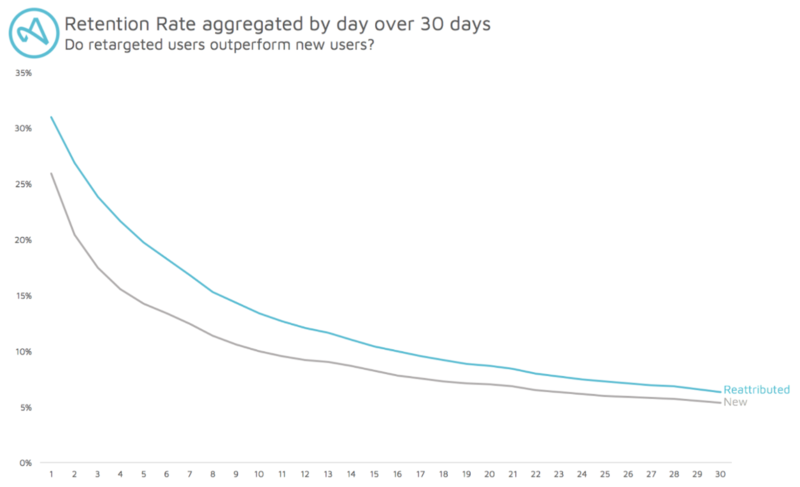 Taking a look at the chart below, which displays retention for the first 30 days of install, on day one retargeted users retain by five percent more than new users. This gap fluctuates within the first week, but then remains at a five percent difference by day seven. Beyond that, the two narrow in difference over time, with reattributed users always remaining in higher numbers for longer. Retargeting campaigns’ cohorts have a slightly higher level of retention rate in the first 6-8 weeks too, but then they become the same. In just a short study, we’ve seen the effects retargeting can have on performance. Users who are reattributed tend to stay for longer, interact more with an app, and generate more revenue than their newbie counterparts. That said, remember that retargeted users have to be new users first, so be clever with your campaigns, and make sure you rigorously test your approach to re-energize lapsed users into returning. If you want to read more, please find the full report here. James is Adjust's content manager. Born Londoner, he moved to Berlin and joined Adjust. James has worked as both a freelancer and within media agencies. Adjust provides app tracking to companies around the world, including Uber, Zynga, and Spotify.